I received some questions after last week's post, Introduction to Distance Running For Lifters. Answer: Some of the arguments about minimalist shoes make sense. The problem comes in the way that people actually use them. Small-bodied and lightly framed runners with excellent foot mechanics and running technique might do a lot better with minimalist shoes than large-bodied runners with heavy frames, or runners with inefficient foot mechanics or running technique. It’s a case-by-case situation. Before one even considers running in minimalist shoes they should start to integrate them into their lives by wearing them while walking and in their day-to-day lives. It is probably best to start with a small amount of minimalism and increase the use of the shoes over an extended time-frame. After an extended period of adaptation and familiarization wherein you pay attention to how you feel then, if everything is going well with the shoes, it might be appropriate to slowly and methodically start running with them. Be thoughtful about the types of surfaces you choose to run on. Seek professional guidance if you have pre-existing issues with your feet or lower body mechanics or if the experiment doesn’t feel good. As with all things, a measured and thoughtful approach is best. Does that sound boring? You’re probably right. Sometimes boring is better. Answer: Keeping it simple, sprinters tend to run on the balls of their feet and this is most efficient for very short efforts. Efficient distance runners tend to strike midfoot. This allows for a quick turnover of the legs, which is desired. It allows allows shock attenuation upon impact with the ground, also important. Most recreational distance runners heel strike. A heel strike suggests over-striding, and thus a reduced rate of turnover for the legs. Heel striking is thought put on “the brakes” with each stride which not only slows the runner down but also sends more shock than necessary through the body with each landing. Recreational distance runners would do well to pattern their foot strike towards the midfoot. The first easy method that I would recommend is to learn to listen to your feet. A heavy heel strike is louder than a lighter midfoot strike. Strive to run quietly. The follow-up method is to work on your turnover. Many moderate strides will make for more efficient running than fewer long clamorous strides. Focus on driving your arms quickly and frequently and your legs will reciprocate. A fast turnover will favour a moderate stride length and you will find it easier to land midfoot with your foot more or less directly under your body at the time of impact. Running can make you healthier and a more well-rounded athlete. And, though it won’t make you stronger it might help your recovery during and after lifting. It also provides a chance to suffer for long periods which must be good for your mind, right? Running for a lifter or non-competitor can be kept pretty simple. I will lay out a few principles to follow. The nitty gritty details can be worked out based on your lifestyle and with a little bit of accumulated experience. The important things are to stay injury free and to be consistent. How do you go about pacing yourself? Hard intervals sound cool and look good on the internet. They are not the way to get started. You will want to build an aerobic base. Building this base requires a pace that allows you to carry on a full conversation. If you are by yourself, or don’t feel like talking, maintain a pace that allows you to breathe through your nose and run with your mouth closed. For the novice or non-competitive runner this is the most important pace at which to do most and maybe even all of your distance running. It will allow you to recover quickly, thereby allowing more consistent training. It may help you prevent injury. It will contribute to the development of the capillaries in your legs so that you become more efficient at doing endurance. A note about running with your mouth closed: when I first tried the nose-breathing approach I felt panicky, right from the first few steps of the run. It kind of reminded me of when I first tried on a mouthguard during boxing or jiujitsu. I stayed committed to it and after a few weeks I adapted and relaxed. Even after you get used to it you may find it hard to keep your mouth closed at the beginning of any run or while going uphill. Not to worry. Just find your groove and try your best to breathe through your nose as much as possible and slow down when you need to. In the spirit of keeping training simple I will close with three methods to keep you healthy i.e. prevent injury. There’s an old adage in running: do not increase your mileage by more than ten percent each week. This Ten Percent Rule is intended to protect the runner from injuries to connective tissue and to other parts of the body that are slower to adapt to training. While lungs and major muscles may adapt fairly quickly, supportive structures can adapt quite slowly to the stresses of running. You do not need a GPS watch and you do not need to track your kilometres or mileage. With just an analog watch you can track time on your feet and that is enough information to follow the ten percent rule. I prefer a simple analog approach to training using minimal or no wearable tech apart from my analog dive watch. If you find such slow increases in weekly volume to be unbearable then you might want to consider jumping on a rower, a bike, swimming, or finding another no or low impact style of aerobic training as a supplement your running. Remember when you are first starting that ten percent of zero is zero. If you have not been running recently then you cannot start slowly enough. For many of the same reasons for which I advocate the Ten Percent Rule, I recommend that you reduce your volume once every month or five weeks. For one week, cut your overall mileage, kilometres, or time on your feet by half. The following week, continue with your usual mileage increase as if the rollback never happened. Whenever possible run on grass or other soft surfaces. Yes, you may be more likely to roll your ankle so be careful. Your ankles will become stronger and, more to the point, you will take less of a pounding on a forgiving surface. If you do not have access to a park or trail then look for safe boulevards and grass verges if running during the day where you can see potential hazards. If you are wanting to race on roads in the near future then it is important to condition your body to running on that type of surface. I would try and keep it to a minimum however. If lifting is your priority then keep it the main thing and structure your running around your strength and technical work. Try running right after lifting to give yourself maximum recovery time before you lift again. Also see how running on your off days from lifting works for you. Keep training simple, let your body adapt at its own rate, and remain consistent. Avoid all the distractions, learn to listen, and then do what your body tells you. Early morning training coming soon. Times to be determined based on demand. Contact us if you're interested. Join us for our second formal internship period of 2018. Learn how we apply the fundamentals of strength & conditioning to our trainees. 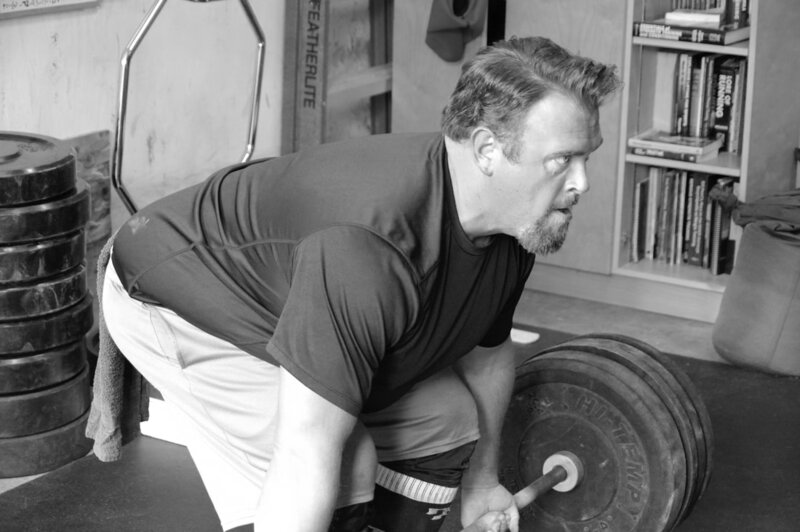 Gain some experience in small group barbell coaching. Get an insight into how our gym is run. Learn about how we coach the barbell lifts and how to apply ideas about physical preparation to real life humans. There is no “life hack” to become good at coaching. You need time in the trenches to develop your eye and your communication skills. We can help you get started on the right foot. Pick up on some of our mistakes from a decade of coaching so that you make fewer of them yourself. -able to work respectfully with a diverse range of people. Members may include cops, social activists, hunters, and vegans. -open minded, open eared, and open eyed. You will need to be “coachable” yourself if you want to get good at coaching others. ​Interns will be introduced to general physical preparation, powerlifting, weightlifting (Olympic), grip strength training and a range of training methodologies as they are applied to a diverse group of trainees. No experience or previous certification required. This is an unpaid internship: a chance to learn and an opportunity to serve our gym community. 1.What is the address of the gym? Can I just drop by? 2. What should I bring to training? A water bottle. Long socks or tights are helpful to protect the legs. Also, the gym is cold. The heater is terrible (and noisy) and the insulation is… not good. Not a problem in the warmer months when the gym becomes overly hot and the neighbourhood stinks. Bring dry and clean non-outdoor shoes. Something like Chuck Taylors or Vans, which are flat and with a fairly firm midsole, can work well if you don’t have purpose-made lifting shoes. Runners are not good but bring them if that is all you have. 3. Do you offer boot camps? We are focused on individualised development and do not run boot camp style training. 4.How does group training differ from private training? The approach to training is the same whether training in a group or privately. All lifters follow individualized programs. Groups are kept small, typically with four members. This allows us to maintain quality and a technical focus. 5. Do I need to have experience or take private lessons before joining a group? A good attitude is the only requirement. 6. Are you a powerlifting gym? We do have members who compete in powerlifting but we have a broader focus than powerlifting. The classic barbell lifts and strength form the foundation of our training. Over the years we have also had members who compete in weightlifting, jiu-jitsu, ultra-running, football, hockey, roller-derby, and ultimate frisbee. Some of us “do not do sports.” Some of us climb or hunt in the mountains. We train a lot of librarians and prepare aspiring cops. The basic element that connects us all is the commitment to getting stronger and better. If raw-style powerlifting is of interest to you then by all means we can help. May 6, 2018. Vancouver, Canada. Reverse Strongman Scoring. All results in pounds. Competitors given the option to weight in as all classes were open. 1.Nick Ratcliffe CoC#2 20 sec. 2. Al Heinemann CoC#2 11 sec. 3. Nathan Wall CoC#2 2 sec. 4. Tara Robertson CoC#1 5 sec. 5. Laura De Pascale CoC#1 4 sec. 6. Christina Matheson Coc Sport 4 sec. Thanks to all competitors, our two volunteer officials, and everyone else who helped out. Special thanks to Eric Roussin for his guidance from across the country. May 6, 2018. Vancouver, British Columbia, Canada. Jim Wendler makes some great points in his talk about the "chasm" between how training is portrayed on social media and how it is actually practiced by coaches in the field. His points about the lack of athletic development that he finds in his high school and junior high football candidates apply very well to adult fitness and novice strength trainees who first walk into the gym for training. For the most part these adults have spent countless hours and years sitting in front of computers, not developing themselves physically, and narrowing their parameters of athletic competence. However inspired they might be by images of powerlifters, weightlifters, ultra-runners, or whatever, their own state of physical preparedness requires a much more simplified and generalized approach to training. What they need to do, first, is very different from what they find in Instagram or Youtube sub-cultures. They need to build a base of strength and movement before they specialize. They need to develop general competence. And, if you are a coach or trainer, you may feel pressure to comply to the narratives of the social media-fuelled fitness subcultures. 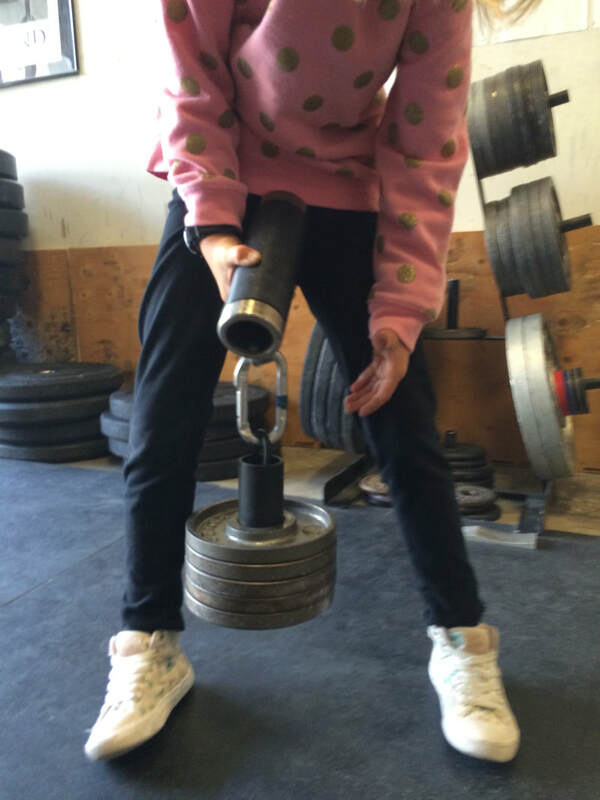 Let me warn you that it is not wise to steer your novice or general fitness-oriented lifters into training like powerlifters or whatever other speciality you identify with. Training them like they need to be trained is not the same as training them as they want to be trained or as you train yourself. A little self-awareness goes a long way. Powerlifting is surging in popularity, and the sport holds an unprecedented appeal to female lifters. Laura, a longtime trainee at Terminal City, recently decided to enter her first competition. She registered for the British Columbia Powerlifting Association Winter Open but she was waitlisted due to the significant demand. We decided to prepare her as if she had a spot in the roster, and in case she did not get in we planned to hold an unofficial mini-meet so that all her training and practice could be topped off with more experience and, if her stars aligned, some personal records. Laura's preparation went very well and, with the help of our interns and her gym-mates, we were able to get in some good technical practice using the commands and demands that she would face in the competitive context. Her taper went smoothly and was well-timed yet just a few days before the meet it was confirmed that she would not get a spot. We did well in making this a non-issue and proceeded with our mini-meet plan, which we were able to do two days after the official meet. One of our interns, Erin, had experience back-in-the-day as both a powerlifting competitor and an official. I served as another referee as did a rotating cast of gym-mates. 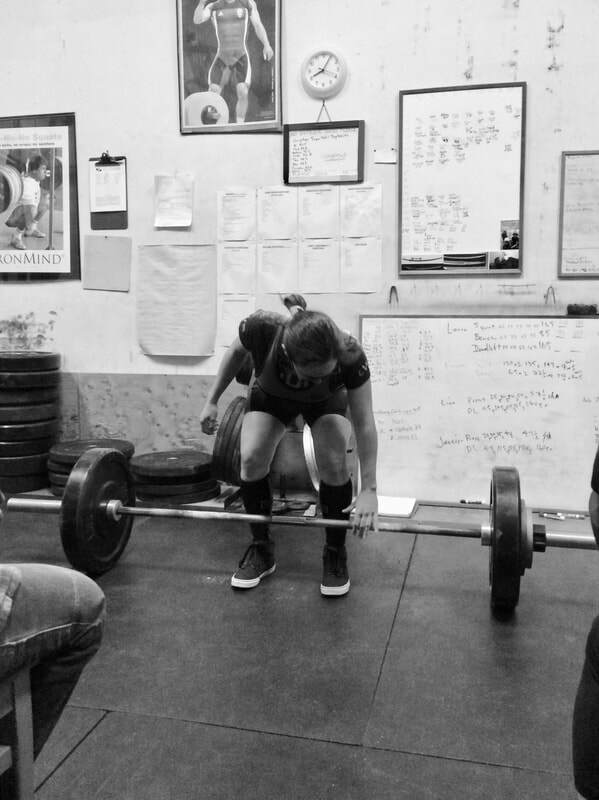 Over the next two-and-a-half hours, with her gym-mates trading off between training and officiating, Laura was able to see success on all nine of her lifts, which was our goal for the meet. She lifted personal bests in her squat, bench and deadlift (185 pounds/105/190). Thank you to all our team members including our interns Erin and Eric, our lifters, and of course Laura for having the guts to commit, prepare, and then see it through. Thanks also to Su for taking photos. 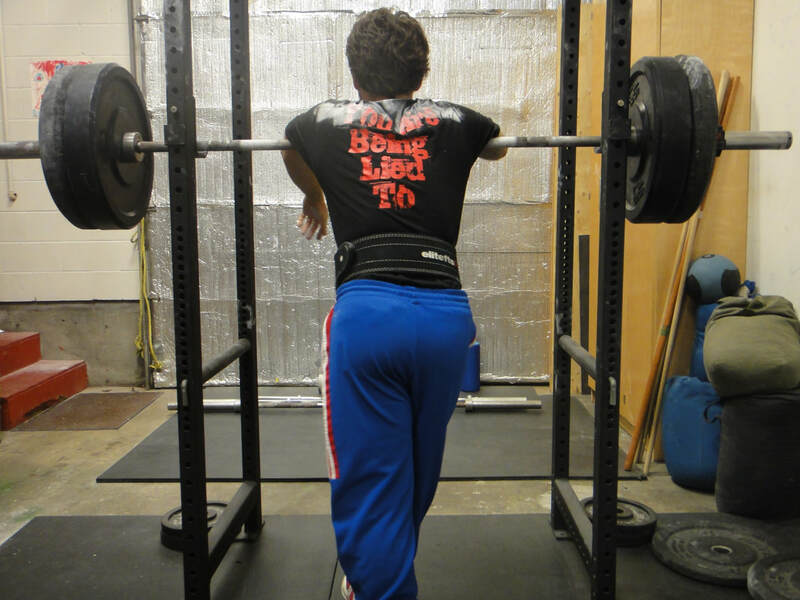 What strategies do you use for novice lifters that struggle to get their depth in the back squat? There is a minority of novice lifters who can hit depth nicely from day one. The rest have to work for it. If a new trainee is not getting desired depth then I typically encourage consistency at whatever depth they can achieve and focus on pushing out the knees. Put the time in, get used to the positions, let the body adapt. This is primary. It can also be useful to have them spend time doing kettlebell squats and goblet squats with lots of time spent in the bottom forcing out knees with elbows. Squat stance width can be a useful variable. A width that allows them to squat deeper can later be adjusted to a more efficient stance as far as force production goes. Have the lifter play with stance and observe closely. Take notes for later sessions. If the new lifter does not have good squat shoes then having them put some micro plates under their heels can help once they are comfortable and balanced with regular squatting in their regular shoes. Let them just get used to squatting first. Have them do the Agile 8 or another appropriate hip mobility sequence during the warm-up every session. For better results encourage them to do this on their own time as well. Keep the sequence brief and simple so that they are more likely to actually do it when no one else is enforcing discipline. ​Best thing of all though has just been to have them squat to their best depth consistently and usually it will come.